Travel is not usually our top priority, it may be on the bucket list under the things we want to eventually get to, maybe once the car is paid off or the eldest graduates or maybe once the little one is a bit older and numerous other excuses. Travelling is especially optional when you own real estate, because so many expenses are in order, never mind the property tax hike you probably just got in the mail, oh and the roof needs replacement, then forget about it, the Caribbean won’t be seeing you for years. 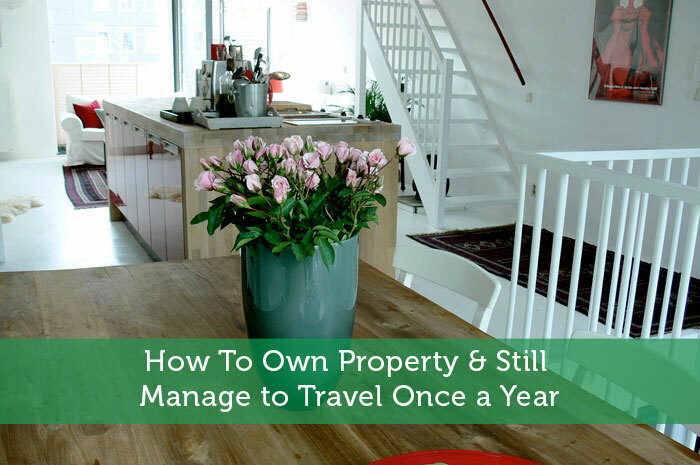 Despite all these expenses there are ways to simultaneously own property and travel once a year. 1. Open a “Travel” Savings Account – The best way to ensure to travel every year is to save for it on a consistent basis. Saving accounts are usually free with no monthly fee and you can have as many as you like. Set up an automatic savings plan with about $40- $50 monthly per person transferred to the travel saving account, it will become a part of your bills and you will barely notice it. Saving on a regular basis will help make trips more affordable and realistic when it comes to planning the getaway. The savings may not cover the entire trip but it will alleviate the additional stress from having to pay from one source of income. 2. Earn Travel Points with a Travel Credit Card – Credit cards can serve a very beneficial purpose when it comes to travelling. Some credit cards can even earn you a free trip! There are many credit cards out there which offer all kinds of travel rewards. Focus on the benefits and features when choosing the card that will work for you. Register your property bills such as utilities etc to be paid automatically from your credit card to collect more points. I have currently collected $600 worth of travel credit, so my next trip will be practically free! A travel credit card usually comes with travel medical insurance, points for purchases and many other benefits and features. Travel credit cards have a high interest rate, it’s more suitable for people who pay off their full balance every month. 4. Make Time for Travel – The Daily Hassles Will Always Be There – There will never be a perfect time to go away. There will always be household expenses, things to get done and fixed, the wheel is always in motion with no way of stopping it. You are in control of your travel plans. The crucial part is to plan the getaway, book your vacation and go. For those of you with children, take advantage of the summer and the winter holidays, pre plan your trip in advance and take advantage of your travel savings account and travel credit card points. 5. Take Advantage of The Employee Ownership Plan – If you’re currently employed with a company which offers a non-registered share ownership plan with a matching contribution then this is a great opportunity to turn it into your travel savings plan. When the company matches your contributions the savings accumulate faster, making it possible for your to travel sooner. The shares also potentially gain value in the market, increasing in value, which adds to your overall travel budget. I have travelled this way for much of my early 20s while employed for a major financial institution. If you’re not employed for a company that offers such a plan, consider investing your travel savings into a higher interest paying investment such as a one year Guaranteed Investment Certificate, high interest savings account or other short term investments. 6. Cottage Time is Travel Time – Sure being a first time home buyer isn’t easy on your wallet. There’s no need to travel far every year, if you’re working with a smaller budget then consider renting out a cottage for the week with the family. It’s more affordable and still relaxing. Cottages and chalets can be even more affordable when splitting the cost between several families. Whether it’s skiing in the winter or beach time in the summer cottage country is available year round. 7. Travel Now and Pay Later – Travel can be purchased with a line of credit or your credit card (earn lots of travel points on larger purchases!) and paid for later. If you know you can borrow responsibly and pay the balance back in a reasonable of time then there is nothing wrong with using your credit to purchase your annual vacation. The credit card allows for 20 days interest free, which means you have time to pay for it gradually with no penalty. If you have a home equity line of credit this allows for a much lower interest rate which can make borrowing money for travel more affordable. The important thing is to plan ahead and pay the balance back within a reasonable time such as 2-3 weeks. Having a strategy and planning ahead is most important when it comes to ensuring your family travels every year. Travelling will not only decrease your stress levels but can also rejuvenate your body, teach new perspectives in life and create endless warm memories. I reside in Toronto, Canada where I also work for a major financial institution, run my own financial blog vostrocorp.com and manage a summer driveway maintenance business. I enjoying watching interviews with successful entrepreneurs. Currently, I’m writing my own personal blog on tips and tricks to better control your finances, stay aware of your path in life and reach your financial goals sooner. I love helping people stay out of the dark when it comes to personal finances. I have a travel account. It’s like I have to be committed to it if I want to get to travel even once a month. Otherwise, I won’t. It’s like a form of motivation, which becomes good I suppose to my health and contributes much money to my travel saving. Thanks for the great tips! I love travelling but I’m afraid that I don’t have enough cash for that so I think I should open a travel savings account now. I own a few properties and I have been getting away a bit lately. It’s not the money that is the issue, it is the tenant commitments. It is like a job, but as anything, can be hired out. Agree! Allot a monthly budget for it and religiously put in the planned amount. Absolutely, it’s not all about the money when it comes to owning property and travelling, a lot of it has to do with time management, expense budgeting and prioritizing! Great idea about saving more and leave space for travelling. Actually, for some people travelling is the reason why they work and make money. Not everyone have to cut down on monthly expenses because they have already done it by means of reasonable resource exploitation and effective budgeting. Another point is using credit: great travel reward cards can actually let you have good deals. I can’t say that some credit reward options can be the best extra source to spend on travelling, but these bonus plans limit your choice and sometimes compel you to purchase where you don’t want or choose to stay in the hotel which you wouldn’t choose if not the 30% discount. Still, these bonuses can grant you some cheap flight offers and very good deals all over the country. So, saving on travelling and keep on travelling is easier today.